A new $6.4 billion international airport is currently being built out of the Pacific Ocean on the eastern coast of central Japan. It's being built on a reclaimed island in Ise Bay, 22 miles (35 km) south of Nagoya. The new Central Japan International Airport, nicknamed Centrair, extends across 1161 acres (470 ha) and will feature an 11,483 foot (3500 m) long runway that is 197 feet (60 m) wide. 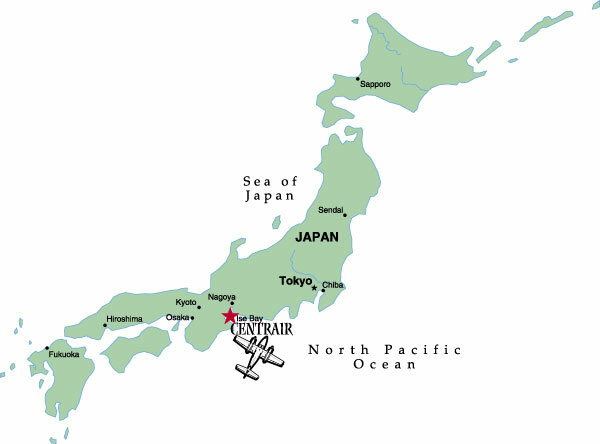 Centrair will operate 24 hours a day and will handle international flights from all over the world, including the eastern seaboard of the United States, southern Europe and northern Africa. It's also expected to handle a large volume of commercial cargo. The central region is home to many of Japan's leading manufacturers, including the automobile industry. Ise Bay's shallow waters and solid sea bed made it an ideal location. Water depths ranged from 9.8 feet (3 m) at its most shallow to 32.8 feet (10 m) at the deepest point. The solid sea bed provided a strong base for the island and eliminates the chance of land settlement occurring. Land reclamation began in 2000. The work was carried out strategically. Certain areas or subdivisions were completed first so construction could begin earlier on airport features like the passenger terminal. A major part of the project is paving Centrair's concrete runway and apron areas, an area of approximately 8,611,410 feet2 (800,000 m2). Three consortiums, each made up of three Japanese contractors, divided the concrete work and agreed to supply their paving equipment. 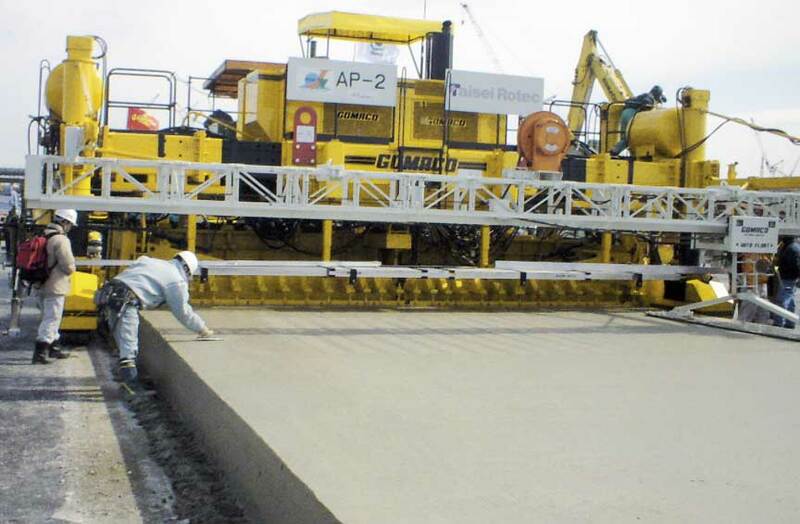 Two out of the three consortiums are using GOMACO GHP-2800 pavers for slipforming. 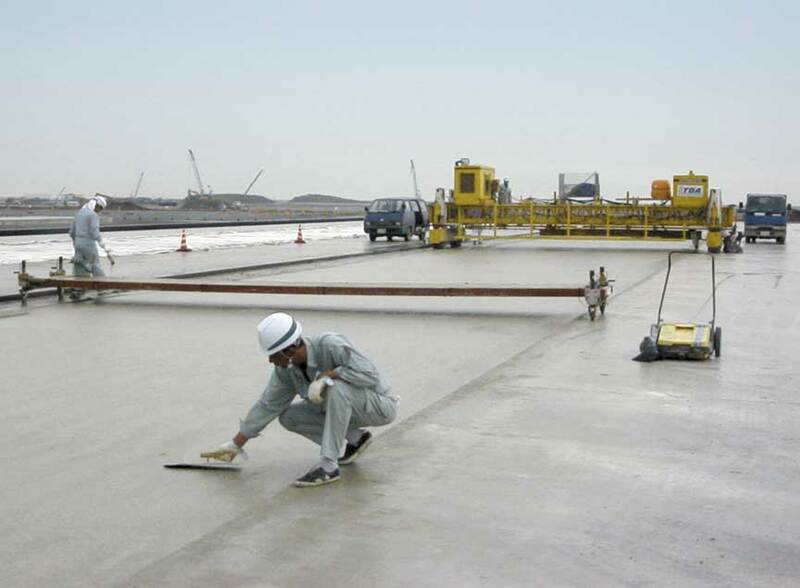 True concrete slipform paving has never been done before on a Japanese commercial airport. Officials were initially concerned that a slipform paver would not be able to hold the edge that the strict standards called for. 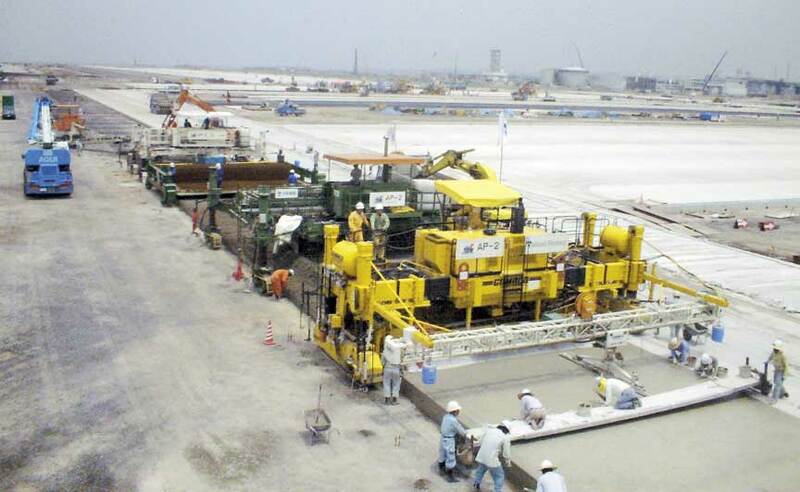 A test pour was conducted in February 2003 on site in front of over 50 visitors from 17 different companies, the Japan Slipform Association and the Central Japan International Airport Company. "All present were in agreement that the tests were extremely successful and 'true' slipforming with the GOMACO GHP-2800 was given the green light for the airport," Tim Nash, GOMACO International Regional Manager - Asia Pacific, said. 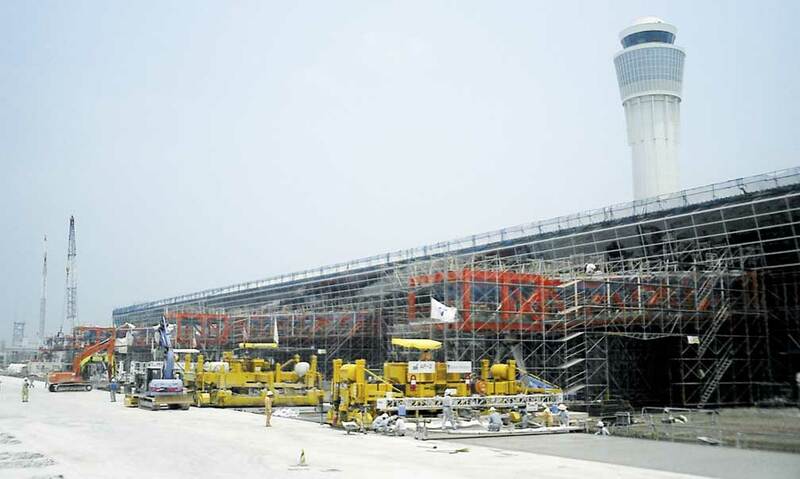 Toa Doro Kogyo Company, Ltd., and Taisei Rotec Corporation would be the first contractors to slipform on a Japanese commercial airport. Concrete paving started in March 2003. Paving passes were 24.6 feet (7.5 m) wide and thickness varied between 16.5 to 18.1 inches (420 to 460 mm). Concrete was supplied by a batch plant on the island just 1.2 miles (2 km) away from the paving site. The concrete mix contained a blast furnace slag powder at a ratio of 9.9 lb/ft3 (158 kg/m3). Slump averaged 1.4 inches (35 mm). Each consortium is using a different placer/spreader. The Toa/Gaeart/Maeda Road joint venture is utilizing Toa Road's PS-2600. The Taisei Rotec/Obayashi Road/Nippo Joint venture is utilizing Taisei's PS-60. 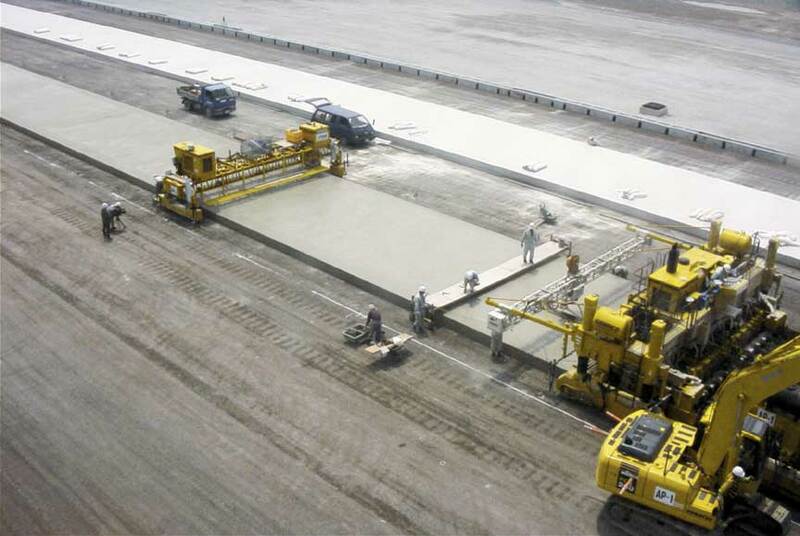 Placing the concrete is accomplished by utilizing two placer/spreaders per paving pass. Concrete is dumped in front of the placer/spreader by dump trucks carrying 7.8 yard3 (6 m3) loads. Toa's PS-2600 spreads the concrete to a thickness of 11.6 inches (295 mm). A mesh cart follows behind and mesh is manually laid on top of the first layer of concrete. A second placer/spreader follows the mesh cart adding an additional 4.9 inches (125 mm) to the thickness of the slab. 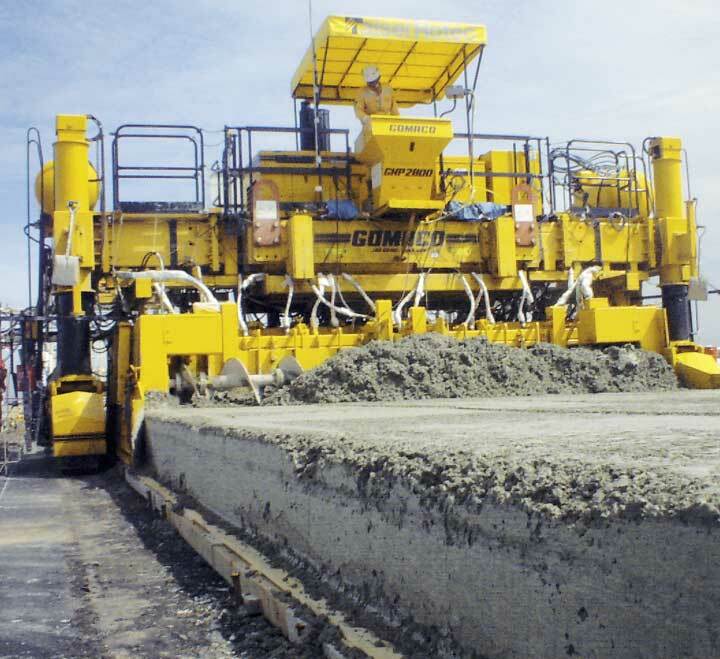 Toa's GHP-2800 paver consolidates and finishes the concrete with the "GOMACO edge" the airport specifications requires. A T/C-400 texture/cure completes the paving train, applying a transverse tine to the new runway. Taisei's paving train is similar. They're using their PS-60 to place concrete. The first layer is spread to a thickness of 12.2 to 12.6 inches (310 to 320 mm). Mesh is laid on top of the layer and the second placer/spreader applies another 6.3 to 6.7 inch (160 to 170 mm) thick layer of concrete on top of the mesh. It's followed by Taisei's new GHP-2800 paver with AutoFloat®. "Taisei purchased the GHP-2800 specifically for this job," Nash explained. "They decided to purchase a GOMACO because they had serious concerns about meeting the criteria on this extremely important 'first ever' slipform construction on a civil aviation airport." A third paver on the project could not meet the strict edge specifications and is paving with forms. 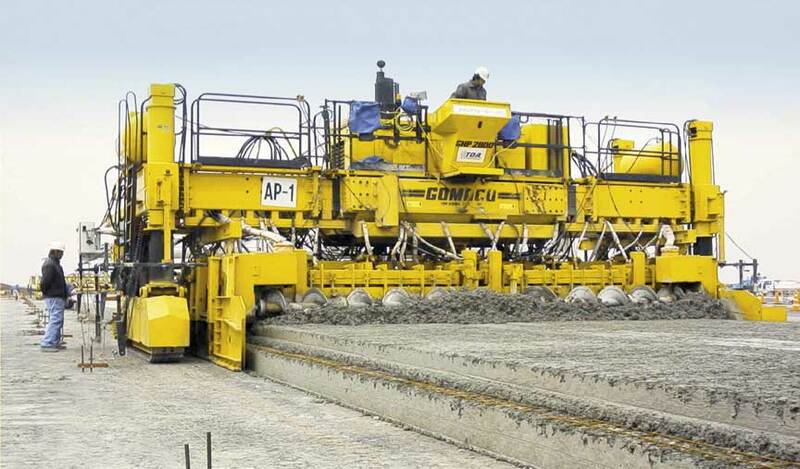 "We pay special attention to the quality of the concrete to ensure a sharp edge on our product," Ryuji Izawa, machinery manager for Toa Road, said. A straight edge is just one of the specifications, the consortiums have smoothness specifications, too. Extra steps were taken by both contractors to ensure the smoothest slab possible. "Your concrete mix design has to be consistent," Tomonori Fujisawa, machinery manager for Taisei Rotec, said. "Delivery of the concrete must also be consistent. We were able to continuously pave without stopping the paver and creating bumps." Paving is scheduled to be completed in April 2004. Centrair airport will open its doors in February 2005 and Japanese travelers and shipments will have a new gateway. "We're very proud that the Central Japan International Airport is the first in Japan where the slipforming method has been introduced and applied to," Fujisawa said. "We invite you to please visit us and this airport to confirm it with your own eyes!" Editor's Note: Special thanks to Toa Doro and Taisei Rotec for sharing photos of their project with GOMACO World. We would also like to thank Isao Nakamura, who works with our distributor, Arayama Corporation, in Japan. Isao's help and translating skills made this article possible. Japan’s new Central International Airport covers 1161 acres (470 ha) and will feature an 11,483 foot (3500 m) long runway. 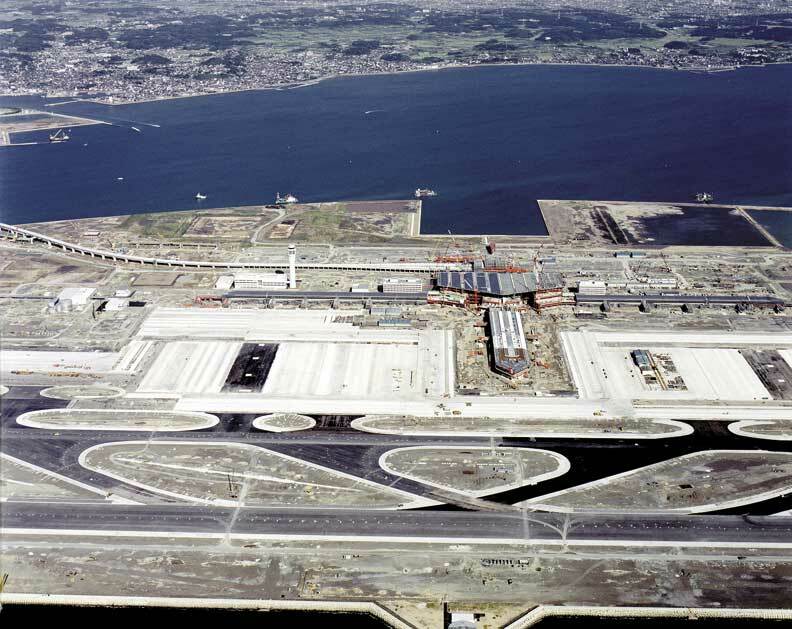 It is the first commercial airport in Japan to feature slipform concrete paving. Two GOMACO GHP-2800s are at work on the project. Toa’s GHP-2800 slipforms on the new runway. They’re paving 24.6 feet (7.5 m) wide and thickness varied between 16.5 to 18.1 inches (420 to 460 mm). Taisei purchased the GHP-2800 paver specifically for this project. They wanted a paver that could meet the strict specifications on this first commercial airport slipforming project. A T/C-400 follows behind the paver applying a transverse tine to the new runway. 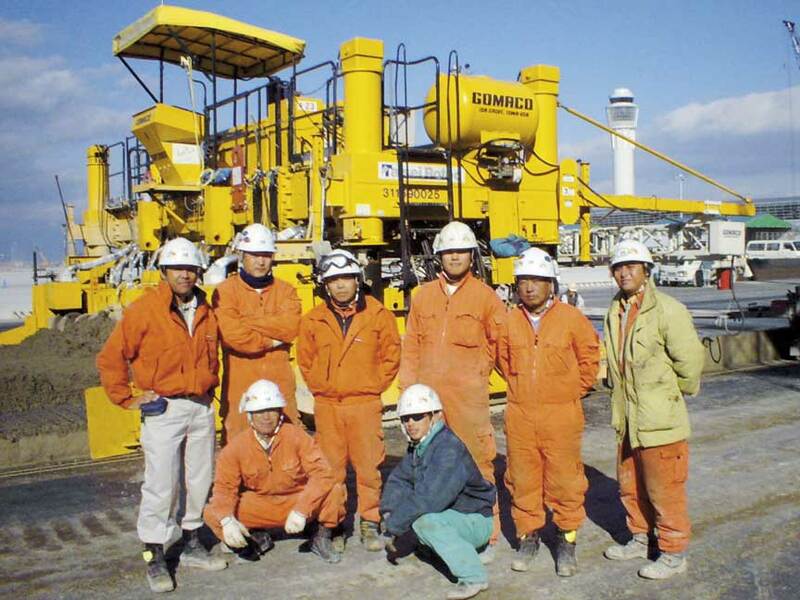 Taisei Rotec’s machine operators take a moment to pose for a group photo at Centrair. 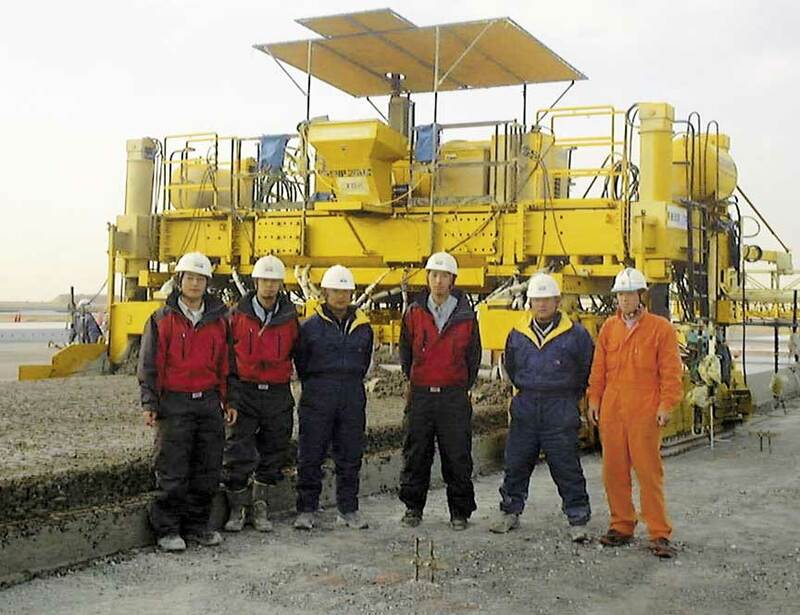 Toa’s machine operators pose in front of their GHP-2800 paver at the Japanese airport. The international airport will open in February 2005. Once open, it will operate 24 hours a day, seven days a week. Quality concrete is the key to maintaining the “GOMACO edge,” said Ryuyi Izawa, Toa’s equipment manager. Concrete is spread to a thickness of 11.6 inches (295 mm), mesh is laid on top and a second placer/spreader adds another 4.9 inch (125 mm) thick layer.